I pulled this silver chain bracelet from the California yard sale finds box (I mailed two boxes home). I don't remember exactly where I picked it up, and it really doesn't matter. Although its a nice little bracelet all on its own, I just have to do something else with it. So ... started pulling out the stuff ... some buttons, a few beads, some small silver crosses, a disney figurine, a couple washers, etc. etc. etc. 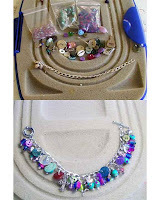 First, attached a charm or beadset to each of the 27 links. Then, added a few more onto random jump rings where I thought a little more chunkiness was needed. Then, changed out the clasp, as I thought the tiny lobster claw was difficult to handle.